Beloved wife of 61 years of Raymond B. Lavery. 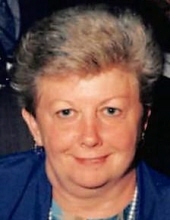 Devoted mother of Raymond T. (Kelley) Lavery, Linda (late Robert) Earley, and the late Laura Lavery. Proud grandmother of Erin, Sarah, Kelsey, Kathleen, Robert, Ashley, and Ryan. Loving sister of Donna McGowan, Nancy Reilly, the late Ward Kirkham, and Mary Ellen (James) Albano. Dear sister-in-law of Richard (Geri) Lavery, Thomas (Carol) Lavery, and Donald (Peggy) Lavery. Dear aunt of many nieces and nephews. Funeral Service Monday 10:30 a.m. at the Robert J. Sheehy & Sons Funeral Home, 9000 W. 151st Street, Orland Park, IL. In lieu of flowers, donations to National Multiple Sclerosis Society, 525 W. Monroe Street, Suite 1510, Chicago, IL 60661 would be appreciated. "Email Address" would like to share the life celebration of Jo Ann T. Lavery. Click on the "link" to go to share a favorite memory or leave a condolence message for the family.